I am really happy to announce our partnership and deep integration with Two Tap. Their core API sets out to solve the very problem described above. They offer a really simple API to let users purchase products directly on your app or website, allowing you to maintain a seamless app experience, without having to break the interaction to load Safari or Chrome. I got to know about Two Tap in the beginning of the year when my co-founder Vinoth had posted a link about them in our private Facebook page. It was pretty obvious to my team and myself that what they were building would be very beneficial to our users, and we are really happy to integrate their service into our offerings. We have baked Two Tap integration directly onto our dashboard. You can access it on the ‘Applications’ tab. Generating your Two Tap credentials is within two clicks! 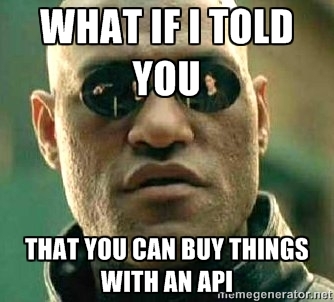 Here is a complete example showing how to purchase a product returned from the Semantics3 API with the Two Tap API. All in under 50 lines! With the combined forces of one of the world’s largest databases of product and pricing information and one of the most comprehensive product purchasing APIs, the limits are endless. You can read more about our partnership/integration from the blog post by the Two Tap team. If you have questions regarding the *Two Tap integration, contact us at support@semantics3.com.